My mission is to take recovery to every sufferer and show them the real science of emotional responses and recovery! Charles is a stress and anxiety recovery consultant to actors, film companies, football and other sports clubs, TV companies and corporates; his work takes him across the world and his reputation for creating recovery in every case is unmatched. Charles is an ex sufferer who developed a curative approach to anxiety disorders and stress that is now the world’s only dedicated, accredited anxiety disorder therapy. Charles teaches this through his educational organisation and events. LAR Therapy is the foundation for The Linden Method Program. His work takes him around the world, often finding himself in the living rooms, dressing rooms and anti-rooms of the rich and famous, famous, infamous and high-powered. Charles is on ‘speed-dial’ of many influential people’s phones and is called into provide fast and effective recovery coaching when people become overwhelmed by inappropriate fear and stress. He has is often a consultant back stage and in front of the cameras on TV shows, his own TV series and the dozens of DVDs, videos and online programs and resources he has been involved with. Charles’ videos have been watched by many millions of people from around the world and when last looked at, we couldn’t find a country in the world in which one of Charles’ clients didn’t live. Hay House publishing call Charles “the world’s most influential authority on anxiety recovery” and we believe he might just be. When clients name their children after you and send you donations, the most generous gifts and invite you to their weddings and birthday parties, some in the Hollywood Hills, you know there is something very special going on. Charles’ suffering has created a gift for all sufferers – A true, scientific, simple, supportive and successful recovery program and professional therapy that changes lives. If you have the opportunity to just sit and listen to Charles talk, do it. In 40 years of psychotherapy and psychology, I have never heard such incredibly eloquently positioned common sense. I didn’t have to say a word, Charles said it all, without hesitation or pregnant pause and it was life changing. Unbelievable. What is recovery? Charles explains. 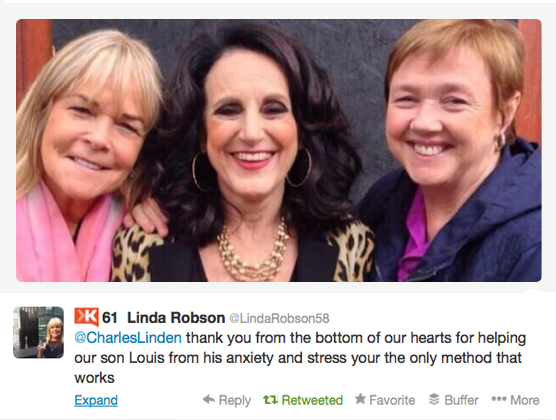 But it’s not just about Charles, our team of mental health professionals assist in providing guidance and support on an unlimited basis to all sufferers. Try and find another person with such a massive following, such a massive quantity of testimonials and such a huge array of supporters… you won’t. Thousands of people including celebrities and sports-people have used Charles’ resources and programs and go on to provide the most amazing reviews, statements and support. Charles travels between Europe and the West coast of the USA to attend events, hold client sessions, attend media events and to fly the flag for anxiety disorder sufferers everywhere. Charles is an outspoken ex sufferer who tolerated 27 years of anxiety before creating his own recovery whilst medicated and receiving regular ‘therapy’ sessions. Realizing that neither drugs nor therapy were the answer, Charles has gone on to develop what psychologists call ‘a new branch of psychological practice’. Charles’ Method is now used and referred to by doctors and psychologists world-over. The obvious curative success of the programme has meant that sufferers’ recoveries have compelled others to recommend it to others. The program is also used by government agencies eager to reach the long-term unemployed. Falling under NICE guidelines CG-113, Charles’ programs are administered by qualified psychologists and psychotherapists and are considered to be the ‘new treatment of choice’ by those who practice. In 2013 Charles developed the world’s first qualification in Anxiety Disorder Recovery through the NCFE at Level 4 – this means that trained practitioners can now administer the solution in the field in a variety of healthcare, educational, corporate and forces settings. This therapeutic approach is unique in content, delivery and curative outcomes. Clinical trials demonstrated 100% efficacy with an average outcome of complete anxiety recovery. LAR has become the world’s first and only dedicated, accredited anxiety disorder treatment therapy. The program is available as a home learning or residential course and qualifications will be awarded to those who pass the course work and demonstrate that they can deliver the program to a very high standard in order to maximise patient engagement and curative outcomes.